Studio founder Christopher Williamson says missing the Kickstarter goal by such a tiny amount is probably for the best in the long run. Coming up $28 short on a $50,000 Kickstarter has to be a huge disappointment, because the all-or-nothing rules of Kickstarter means that no matter how close you come to your goal, if you miss it, you get nothing. Compounding the blow for the developers of Alpha Colony is that they've already sunk ten months and more than $60,000 of their own money into the game. "It is so frustrating to come so close, but clearly there simply isn't that much interest in building the kind of game I envisioned," Williamson wrote on the Alpha Colony Kickstarter Facebook page. "I have already invested everything I have getting my dream this far (twice!) and now I must feed my family and focus on projects that will pay the bills." Yet in spite of his disappointment, Williamson also expressed relief that the Kickstarter didn't actually manage to limp across the finish line. "Although many consider this a failure and unfair, in the end, it is perhaps the kindest thing the universe could have done for us," he told Gamasutra. "To be committed to deliver my dream game underfunded, understaffed, and sub-par, and to lose even more time and money would have been even more heartbreaking." "[$50,000] may seem like a lot of money to many, but by the time I pay 3D artists, animators, designers, and programmers, issue figurines, prints, T-shirts, shipping, etc. there will be nothing left for me and my team and we would end up with a game far short of what I had envisioned building," he added. This was actually Alpha Colony's second crack at Kickstarter. The first was canceled on July 27 after raising more than $100,000 of a $500,000 goal, which Williamson said is what he thinks would actually be needed to get the job done properly. "We scaled it way back and added stretch goals to $300k on the second Kickstarter in the hopes that we could at least achieve the same $100k level we got before," he explained. Despite the setback, it's unlikely to be the end of Alpha Colony. "Perhaps we will try again at some future point once I have attended to my personal and team's immediate financial needs," Williamson wrote on Facebook. 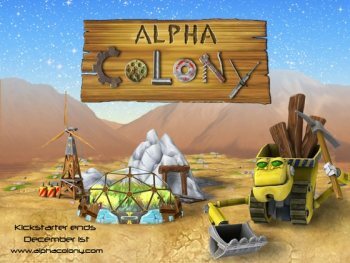 "I have been trying to build this game for almost 14 years so I doubt this is the end for Alpha Colony, but I do have to be responsible business owner and father and accept the reality of where we are at the moment and what the world wants."